"…A pot, a pan, a broom, a hat." I hope you all have had a good week. I haven't blogged every day this week, because it would've been the same blog over and over! Yep, one of those ordinary, boring, nothing-exciting-happened weeks…for which I am extremely grateful!!! Neither Isaac nor I have felt very well this week, so we have laid low, taken it easy, and for Isaac, had lots of naps. His mystery fever was back for a couple of days this week. <sigh> We still don't have a clue…but are keeping a really close eye on him. We can't just ignore it, of course…something must be causing the low-grade temps. Here's a question for you medically-minded people out there, or for those with medically fragile kiddos: Could the temperature in the house cause him to run a temp? Our house is small with one window until a/c, and we run 2 fans 24/7 to move the air into his room. However, we are in Florida, and the temps get extremely high outside; and due to very little insulation, the room that the sun is shining on gets very hot. Isaac's room is on the northwest side of the house, so it gets a full blast of afternoon and evening sun. His room probably gets to 80* or better some afternoons. Could this cause his temp to go to 100*? I know his brain doesn't regulate his temps very well, but I just don't know if it could cause that much of a rise in his temp. Any input or ideas would be very much welcomed. 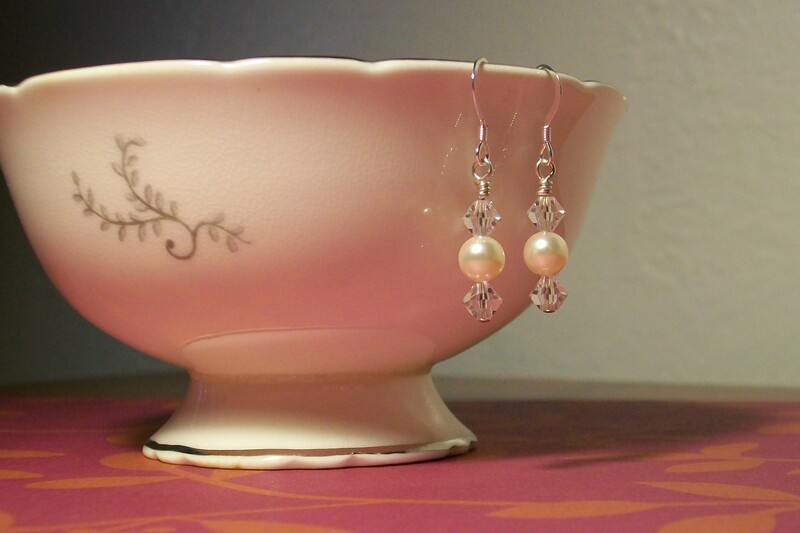 I sold a pair of earrings last week! It was very exciting, because they were bought by a person unknown to me. Just someone who found my site and liked the jewelry, I guess. I really hope they like it when it gets there. I always want my customers to be very pleased and satisfied with their purchases. My mom has blessed me the past 2 months by paying a friend to come and clean at my house for a couple of hours a month. It has been such a blessing. She does such a nice job, plus it is nice to fellowship with a friend while we're working. We've worked out a plan for her to come an extra time each month: I'm going to make jewelry for her and she's going to clean for me. : ) : ) : ) I am so excited and pleased to be able to do that! I'm needing to be very careful with my back this week. It is feeling very "fragile", so I am not doing much with Isaac or the house. We just sort of put everything on "hold" if we can. For those things that can't wait, my hubby works very hard to take care of them. For any new Facebook friends who have wandered over here to my blog, feel free to check out the "All About Isaac" tab at the top of the page. It has his adoption story there, and also a little bit about his medical condition. I guess that's it for this week. I am hoping to resume my regular blogging schedule soon, but it's still summer, so we'll see! : D I don't consider the summer finished until September starts…I'm just "old school" that way! I pray that ya'll have a wonderful weekend, and that you are able to assemble with other Christians and worship the Lord together. I know sometimes you just can't get to church; but if you can, I hope that you will. If you cannot, I invite you again to watch our services online: Landmark Baptist Church. ps I’ll ask my hubby about the temp – he is an RN. I’m such a dork, I skipped right over the first sentence somehow. That would be Fiddle on the Roof! That is interesting about Isaac’s fever if it is related to the temperature in the room. Poor, little man. Have a great week, Alesha! I’m so glad I found your blog. I read about Isaac and immediately put him on my prayer list. God must really love that little boy to have blessed him with parents like you. I also found your jewelry site. I like what I see. Do you make earrings for unpierced ears? If so, I’m definitely interested. I’m looking forward to meeting you! Billie, I don’t have any clip-on earrings in my collection right now, but I certainly can add some. On my Etsy site, you’ll notice a link on the right side that says “contact aleshakay”. Click on that, and tell me what color you are looking for, and also whether you’d prefer sterling silver or gold filled. Just leave me a message there, with all your ideas, and we’ll see what we can come up with. I love working on custom orders, and since you are local to me, there would be no shipping costs. Some how I missed this post until my morning. You know those temp spikes could be weather/house temp related. If I were you, I would record the house temp at the same time you record Isaac’s temp… do this for a few days and see if there is a connection. It might not be, but them again, when it comes to our boys they will try anything to get their mamas to fret!! Take care of you my friend! !